Writer, actor and director, Rabia Louis Haynes, brings stage play about Rev. Martin Luther King, Jr. to Memphis metro area in Collierville, TN. 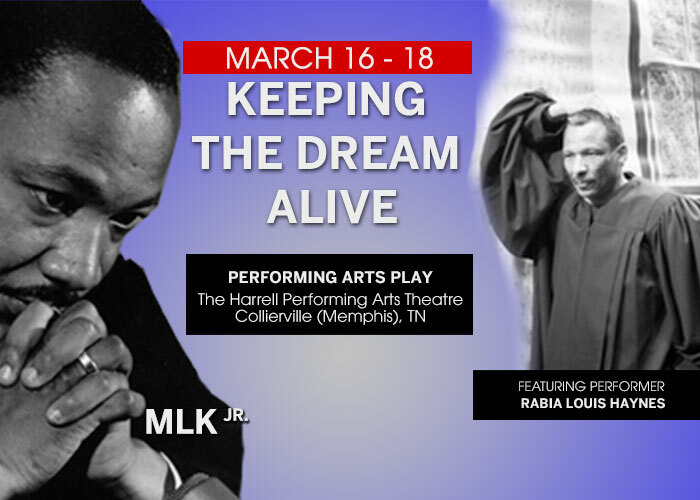 Memphis, TN (The Wire Press) – Keeping The Dream Alive is a performing arts play that is honoring the legendary minister and activist Rev. Martin Luther King, Jr. and is set to come to the Memphis metro area March 16 – 18, 2018. The play features an impressive performance by actor, director and writer Rabia Louis Haynes who, in the past, was a Production Stage Manager and Technical Director for the likes of legendary music artist and songwriter Smokey Robinson and an apprentice for the award winning director, producer, and screenwriter Steven Spielberg (Jaws, Jurassic Park, Transformers, etc.) for the movie Terminal. Like Rev. Martin Luther King, Jr., Haynes’ story is very similar – he grew up on the south side of Chicago and it shows through his performance which many patrons have said is unforgettable and makes this event more than just a play. On April 4, 1968, Rev. Martin Luther King, Jr. was shot and killed on the balcony of the Lorraine Motel in Memphis, TN. Before the unfortunate incident, Martin Luther King, Jr. had a dream revealed in his “I Have A Dream” speech that echoed across the world. Today many are doing things to keep that dream alive and that is what the “Keeping The Dream Alive” performing arts play is about. The three day event takes place from March 16 through March 18, 2018 at The Harrell Performing Arts Theatre in Collierville, TN in the Memphis metro area. Tickets can be purchased on Eventbrite at https://www.eventbrite.com/e/keeping-the-dream-alive-tickets-38473678809.